Mattawoman Creek is a twenty-mile long river and scenic freshwater-tidal estuary flowing into the Potomac River at Indian Head Maryland. It is Maryland's last freshwater-tidal estuary on the Potomac to have escaped significant degradation from urbanization. This is changing as past growth policies in Charles County take a toll. But in 2016, a new comprehensive land-use plan was adopted that could turn things around! Come see why so many are working to save this special place! On the tidal freshwater estuary near its mouth with the Potomac River. Features: Boat launches, fishing, picnicking, camping, nature trail, historic house of William Smallwood, revolutionary war general and 4th governor of Maryland. Nominal entry fee. From the east using U.S. 301: Take Route 301 south to La Plata, to west on Route 225. At the light at Route 224 turn left (south). Park entrance is approximately 3 miles on the right. From the west using Route 210: Take 210 south towards Indian Head, take a left (east) at a traffic light onto Route 225. Cross Mattawoman at head of tide and turn right at the next light onto Route 224 (south). Park entrance is approximately 3 miles on the right. On the tidal-freshwater estuary at mid-estuary. Features: Fishing pier, boat ramp, picnic tables, paddle through Maryland Wildlands. Upstream are some of the finest tidal freshwater marshes to be seen. Abundant wildlife, including eagles, egrets, ospreys, herons, geese, ducks. provides rentals at reasonable rates and offers outdoor programs and tours. Rentals at Mattingly Park: Saturday & Sunday, 10 AM - 6 PM. Directions: From the beltway, take Rte 210 south to the end of the highway (about 20 miles). Just before the entrance gate to the naval facility, turn left onto Mattingly Avenue. The avenue dead-ends at the Mattawoman estuary. Parking is available a half-block before the creek; there is limited parking at the boat launch on the creek itself. Maryland Wildlands—No facilities. Please respect nature. Features: A restful fifteen minute stroll (one way) on a blazed natural path through a forested state-designated Wildland to the shore of the tidal-freshwater estuary. Birding, waterfowl, photo-ops. Directions: From the beltway take Route 210 south (Indian Head Highway) After about 14 miles, pass through the light in Bryans Road. Continuing on 210, pass through a blinking yellow signal and turn left at the next traffic light onto Rte 225. Take Rte 225 across Mattawoman Creek and turn right at the next light onto Rte. 224 (Chicamuxen Rd), heading west. About 0.7 miles from the light, look for Lackey High School on your left. The trail head will be off the right shoulder 0.3 miles past the high school driveway. (The trailhead is at a grassy outcropping off the shoulder immediately after the 1st telephone pole beyond a guardrail.) Small DNR signs and large heaps of soil that block dumping mark the trail head. A thirteen mile paved biking and walking path on the old (1918) Navy railroad bed that runs between the town of Indian Head and Route 301 in White Plains. 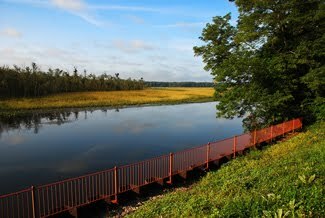 Features: Overlook of the upper tidal Mattawoman estuary, and glimpses of Mattawoman river. Extensive woods, wetlands, and wildlife. See forest and farms that will be protected with low-density zoning as a Watershed Conservation District once the 2016 Comprehensive Plan in Charles County is implemented. Directions: From the beltway, take Rte 210 south to the end of the highway (about 20 miles) in Indian Head. The trailhead is off Mattingly Ave, the last street on your left, but no parking is available there. To park, turn right off 210 onto Lackey Drive, turn left at its dead-end onto Dr. Mitchell Ln. Park off the this road. After parking, follow signs/road markings to trail.